The Bellanca company had a long pre-WWII history of building efficient light aircraft. Giuseppe M. Bellanca emigrated to the United States from Italy and was an early builder of aircraft in the 20's. He established a reputation for designing highly efficient and fast aircraft starting with the Bellanca CF series. Eventually G. M. Bellanca came to work for the Wright company, where he was commissioned to design an airplane to showcase the Wright company's new J-5 Whirlwind radial engine, the first truly reliable aircraft engine. The resulting airplane was the Wright-Bellanca, which Charles Lindbergh tried to purchase for his transatlantic trip. Unfortunately for Bellanca, the owners of the airplane played games. They informed Lindbergh that they'd be happy to sell the airplane but that they would name their own pilot. Lindbergh understandably walked away and took his business to Ryan, and subsequently made history with the Spirit of St. Louis (also powered by a Wright Whirlwind). It was a close thing, though, because the Wright-Bellanca was ready to fly through the spring of 1927 leading up to Lindbergh's flight and both planes were located at Roosevelt Field near New York City. What kept the Wright-Bellanca on the ground was not mechanical problems but the courts, since the owners were suing each other over who would be the pilot. Ultimately, the Wright-Bellanca, named Miss Columbia, did make a transatlantic flight from New York to Berlin two weeks after Lindbergh's milestone. In many ways the Miss Columbia flight was more interesting technically, since the Wright-Bellanca was a general purpose airplane seating more than one passenger. The only modifications for its transatlantic flight consisted of removing the rear seats and replacing them with extra fuel tanks. By contrast, The Spirit of St. Louis was purpose-built for the transatlantic flight and only carried one passenger in an awkward blind cockpit. Lindbergh did, however, have the vision, innovative ideas about navigation, and ultimately had the will to make the flight and make it first, and he deserves his place in history along with his airplane. G. M. Bellanca found new, more upstanding, financial backers and continued to build airplanes. 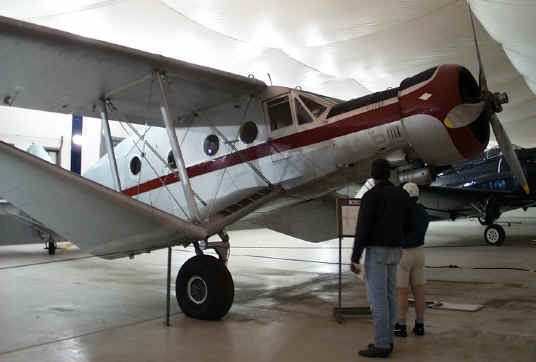 Descendents of the Miss Columbia evolved into the CH series, which were used in numerous famous and record-setting flights. 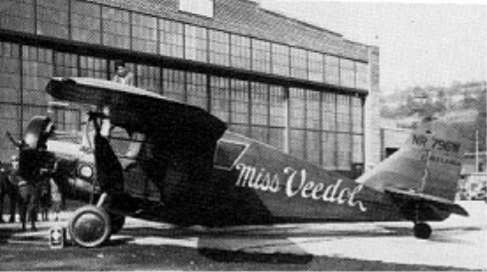 One of the most notable was the Miss Veedol, flown by Clyde Pangborn on the first nonstop flight across the Pacific in 1931 from Japan to Wenatchee, Washington. To save weight the wheels were jettisoned after takeoff, and the aircraft belly landed (e.g. crashed) upon arrival. A replica known as the Spirit of Wenatchee is currently being constructed to commemorate this flight. G.M. Bellanca's designs turned out to be excellent bushplanes, and his Pacemaker and Skyrocket designs saw extensive use in Canada, Alaska, and bush locations around the world. One of the most interesting looking is this Aircruiser, which is located at the Tillamook Air Museum in Oregon. 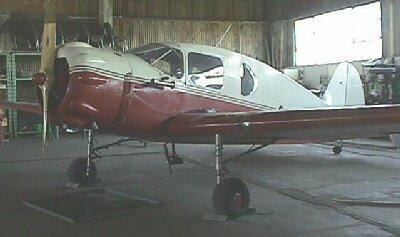 This aircraft is huge and has the distinctive Bellanca airfoil-struts. In the late thirties Bellanca realized that cheaper, smaller airplanes were the future of general aviation. The Cruisair Junior was initially designed in 1939 as a light, three to four place cruiser powered by a 70hp or 90hp LeBlond radial. This very rare Cruisair Junior is kept at the Carolinas Air Museum in Charlotte, North Carolina. Following the war the model 14-13-2 Cruisair Senior was built in relatively large numbers with Franklin 150 hp 6 cylinder flat engines and a Aeromatic propeller. The main landing gear retracted into the wing using a manually cranked bicycle chain system. This photograph shows a nicely restored 14-13-2, although it has been upgraded to a non-original Lycoming engine. You can distinguish the earlier 14-13 Cruisair series from Cruisemasters by smaller tail end boards which are shaped vaguely like kidneys as opposed to ovals on the Cruisemasters, and smaller details such as Aeromatic propellers, size of the cowling, and ailerons with external bellcranks and exposed control cables. Some Cruisairs will look like later models because they have been converted to larger Lycoming O-360 or O-435 engines with controllable propellers. The original Bellanca company folded in the mid-50s, however the design continued to live on with the Northern Aircraft Company (aka Downer Aircraft), who produced upgraded Cruisemasters. The first model 14-19 Cruisemaster was a strengthened Cruisair with a 190 hp Lycoming O-435 flat 6 engine, which was succeeded by the 14-19-2 with a 230 hp Continental O-470 flat 6. The different models are often known by their horsepower as "190's" and "230's". The Cruisemasters were upgraded with a stronger wing and frame, higher weights, hydraulic landing gear and flaps, fully enclosed aileron push-pull rods instead of external cables, and larger tail boards as compared to the Cruisair. The 14-19-2 was the last taildragger, as with the introduction of the short-lived 14-19-3, or "260", where a nosewheel was added and the engine upgraded to the 260 hp IO-470 Continental. Other construction details remain fairly consistent with the 230, such as wire-braced horizontal stabilizer and triple tails. The 260 led directly to the development of the 17-30 and 17-31 Viking series, with larger engines, turbocharging, and externally a single large swept vertical stabilizer with strut braced horizontal stabilizer. All of the Cruisemasters and Vikings share the type certificate and wing design, and they have almost identical cabin sizes. The Vikings are heavier and faster but they fly very similarly to the Cruisemasters. I think the Viking would be an excellent compromise plane for the IFR cross-country mission. The Viking was quite popular in the 60's and 70's, and many used Vikings are available on the market. Although production is very limited today, the many-times-reincarnated Bellanca company still exists in Alexandria, MN and is building to order a few new Vikings a year.